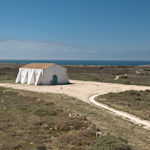 Ponta de Sagres represents a unique aspect of the exceptional botanical diversity of the Natural Park of Southwest Alentejo and Costa Vicentina. This location is host to plants of Atlantic, Mediterranean, and North African origins. The unique conditions of the soil and climate encountered in the Vicentine Promontory has given rise to several plants that only exist in the Algarve, some of which can only be found in Sagres. This former ammunition and supplies storehouse was recuperated in 1793 and kept its functions as an artillery depot. In 1840 it was used as a stable. During reconstruction and restoration works carried out in 1959/60, it was converted into an auditorium and additions were made to the original building. Referred to since the mid-18th century. The ruins were consolidated during restoration works carried out during the 5th and 6th decades of the 20th century. Strategic position prepared to install artillery. 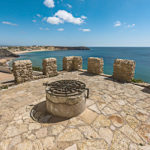 It defended and kept watch over coastline and access to Mareta beach. To shelter sentinels. These structures were located at the forward angles of the fortification or at points that gave a clear view of the surrounding area. 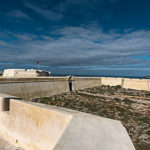 The first bastions of the Sagres fortress were built by order of King D. Sebastião in 1573. They are represented in the drawing done during the attack lead by Francis Drake in 1587. From the original wall built by order of Prince Henry, the Navigator, one can only see small parts of it, because the stone was reused in the renovation of the bastioned wall. 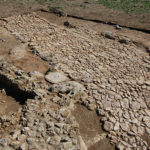 However, there are ruins of the caserns represented on the plans from the 17th and 18th centuries and of the old stone paved road. This building replaced, around 1570, the original church of St. Mary built by order of Prince Henry, the Navigator in 1459. 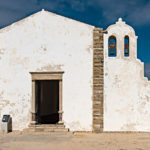 Damaged by the earthquake of 1755, various renovations were carried out and some changes were made; to the nave and the chancel were added the sacristy and the bell tower, which envelops the old charnel house of the Sagres cemetery. Probably constructed at the time of Prince Henry, the Navigator (between 1443 and 1460). 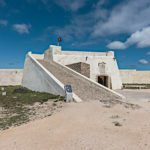 It is frequently represented on charts, plans and drawings of the Fortress of Sagres as from 1587. 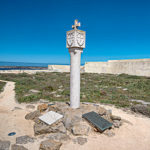 Replica of the marker stone (Padrão) used by the Portuguese navigators in the 15th century to mark newly discovered territories. It displays the coat-of-arms of Prince Henry, the Navigator. Built with 48 stone tiers, disposed radially on a 50m diameter round yard, this enigmatic structure was unearthed in 1919 and, thence interpreted as a «mariner’s compass», related with the seafaring school allegedly founded here by prince Henry, the Navigator; it was cleaned and consolidated in 1959. 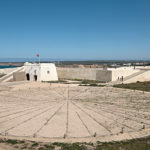 Another theory presents this construction as a monumental gnomon, a sundial built in the 16th century for study purposes and to support naval and military activities that occurred on this site. 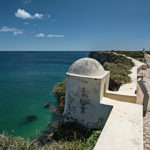 It was built to replace an unfinished bastion from the reign of King João IV (1640 – 1656). It was dedicated to St. Anthony, one of the Portuguese Army’s patrons and patron saint of the 2nd Lagos Infantry Regiment by letters patent of Afonso VI (1668). 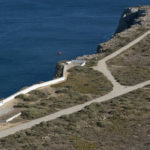 Its defensive purposes were accomplished by crossing the fire shot from its batteries with those placed on St. Barbara bastion. Dedicated to St. Barbara, patron saint of artillerymen, it replaced an unfinished bastion begun in the reign of D. João IV (1640-1656). 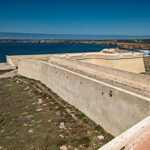 Its defensive purposes were accomplished by crossing the fire shot from its batteries with those placed on St. Anthony bastion. Reconstructed in 1793 by José de Sande Vasconcelos, colonel of engineers. It substituted the entrance turret erected in the reign of Philip II (1581-1589), on the barbican walls dating from the time of Prince Henry, as shown in the drawing done during the attack by Francis Drake in 1587. It defended the main entrance to the Fortress, articulating the fire power of its batteries with that from the flanking bastions. This curtain wall, adapted to install defence artillery, substituted the primitive 15th century fortification. 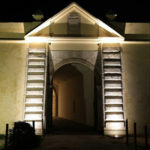 The neo-classic Square Door’s pediment bears a coat-of-arms and an inscription dated 1793, that reads the name of the Algarve Kingdom’s Governor and Captain-General, at that time, Dom Nuno José Fulgêncio João Nepomuceno de Mendonça e Moura. A mechanical device was placed here to raise the chained drawbridge from inside the fort. 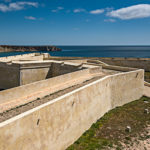 The bridge is represented on the plans of the Fortress of Sagres as from the mid-18th century. Its purpose was to allow the access to the fortress over the moat that preceded the wall in front of the Square Door.